teapots happen » Blog Archive » am I behind you? I was out breaking in the camshaft on my newly-resurrected Buick with a friend, just driving around town aimlessly, talking and listening to music. Suddenly I decided I would call our friend Joe, who I hadn’t seen in a month or two – thinking maybe he’d want to get picked up and come for a cruise. It turned out that he’d just pulled up behind us, with his girlfriend/my friend Megan. Just as she asked him if the car ahead of them was mine (it’s pretty distinctive looking), his phone rang, and, of course, when he answered it was me on the phone. It was impossible to write it off as a coincidence – nor could I find a way to believe I had somehow seen him coming and been prompted, since they didn’t even pull up behind me until I’d already dialed him. We’re in a good sized metro area, both of us across town from our homes (they were on the way to a coffee shop, and I was just randoming around trying to put miles on the new camshaft). 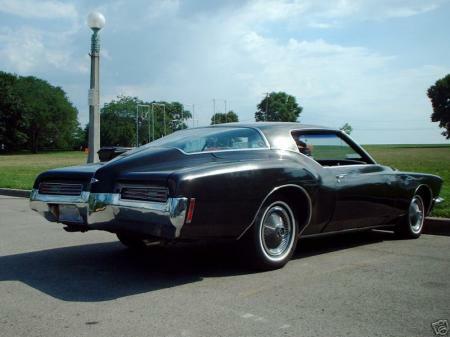 My car – a boattail Buick Riviera- has a curved, low-visibility rear window – but it didn’t matter anyway since it was fully dark at the time, so all I could have seen of them was approaching headlights. And the clincher: since I’d last seen them, Megan had bought a new car – so there was no way that I could have unconsciously recognized their vehicle, either. So … psychic event, or synchronicty … or is there any difference? Weird weird weird. And totally awesome. Psychic vs synchronous? No difference at all, in my opinion. Also, that is a sweet ride. If owning a car was an economic possibility for me (here in NYC, it’s really not worth the trouble) I’d be totally jealous. I love this stuff. You know “they” say there are no coincidences and I believe it! ian – thanks! I’m not much of a car guy, but I fell in love the first time I saw one of these … it’s not very sensible in the city, but out on the open highway it makes the high-octane low-fuel efficiency so worth while … took it all the way down to New Mexico last year and back – my friend paid for gas and it wasn’t cheap, but it enhanced the roadtrip incredibly. And as for the psychic vs synchro thing … I tend to agree that most synchronicities could be explained by some kind of “psychic” occurrence – but I also think it goes beyond ‘telepathy’ and the like, and is indicative of the unified interconnectedness of the universe, the illusionary nature of time, etc etc … probably because my experiences with synchronicity got kickstarted by a mystical experience, so I tend to tie them in together? And speaking of Megan and coincidences – the same month that I was hit with Optic Neuritis in my left eye (http://teapotshappen.com/2009/05/20/sweet-tea-synchronicity-multiple-sclerosis), Megan woke up blind in her left eye one morning. She never regained her sight, and the doctors never figured out why it happened – but it involved some kind of optic neuritis.